The disadvantage of using a cloud based system is that sometimes the back end system stops working. As has happened today. 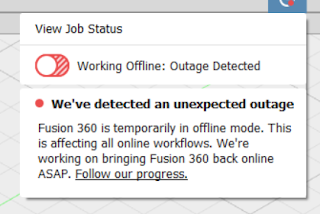 This is most frustrating because the error messages were inadequate and I re-installed Fusion 360 in an attempt to get it working. Initially there were no error messages just a '(Not Responding)' in the title bar. I left it ages and retried several times before resorting to re-installing. 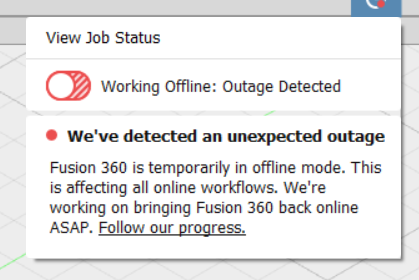 It was only after the re-install that I got the error stating that AutoDesk had some issues. I had assumed it was related to me installing the latest Intel graphics drivers earlier today. I now know that was unrelated! 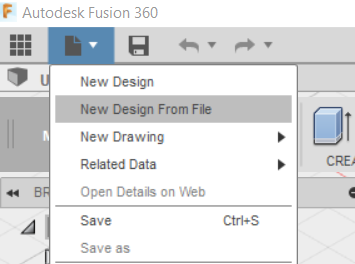 The re-install of Fusion 360 was painful because I had to delete all references to AutoDesk and Fusion 360 from the Windows registry before the install would complete. Finally back in to Fusion 360 and it took me a few minutes more to work out how to open a previously saved archived version of one of my files. It's 'New Design From File'! What's wrong with the traditional 'Open'. Now I'm in, it works offline. Not ideal but able to work. At least I would be able to if lunch time was not over and I need to get back to my other work. To fully work offline you can use the 'Export' function to save the changed file back to local storage. Not particularly user friendly when working offline.